I finished quilting my x plus quilt this weekend! The velveteen backing feels so amazing. I cannot wait to wrap up in this quilt on the couch. Some people have been asking how it was to quilt the velveteen, and honestly I feel like it was just as easy as a normal quilt if not more so, provided it's basted well. I used a lot of pins! The feed dogs grip the velveteen as it's going through the machine and pull it along really well. It is heavy though, so I had to make sure it wasn't getting stuck due to the weight while quilting. I kept it simple and quilted along the edges of the pluses and through the middle of the x's, and I'm happy with how it turned out. I used Aurifil 28 wt variegated black and white thread on the front. I like how it looks but I wish the stitches looked more defined in the black areas like they are in the white. It's all squared up and ready for binding! I've got a few options but I'm leaning towards this Architextures text print. I like the way it ties in both the blacks and whites! Shouldn't be too much longer before this quilt is finished! i love this quilt so much. seriously. so. much. It looks absolutely stunning! Can't wait to see it all finished up! What a beautiful work of art! What are its measurements? I love this so much! this will definitely be my inspiration for my try at an x + quilt. i really love how you quilted it too. all around amazing. So beautiful! I bought yardage of that blue and purple print in the quilting cotton to use as a quilt back at some point, but now I am wishing I had bought the velveteen. It's so beautiful! I love it! I am so in love with this quilt ! The colors are vibrant, it's incredible ! This may very well be my favorite x plus quilt. It is incredible. Gorgeous!! 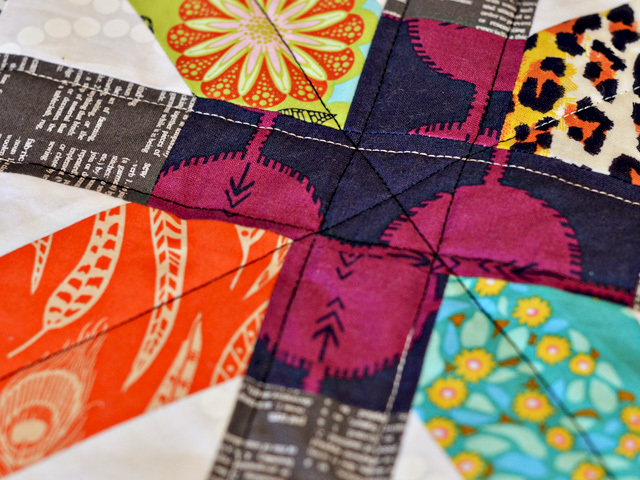 Love how you did the colour placement for the blocks and the quilting! 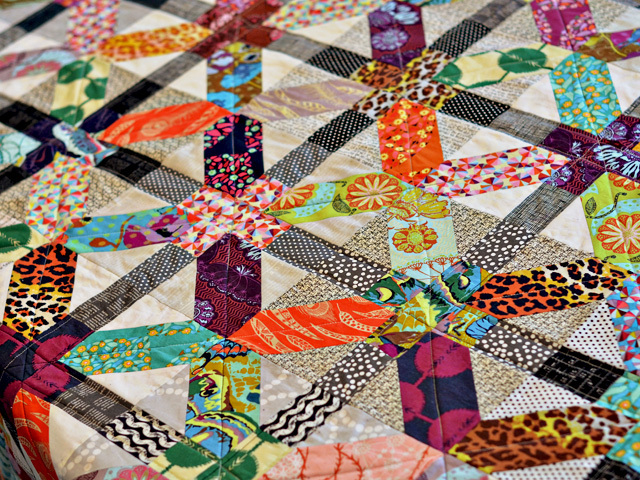 This is so gorgeous, and is definitely one of my most favorite quilts ever!! I just love it!! 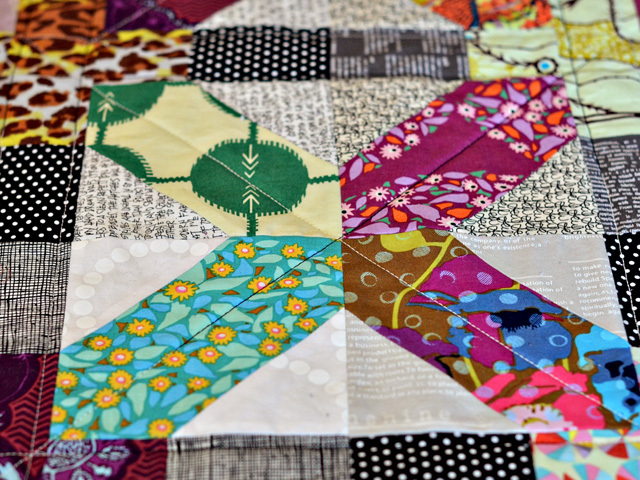 Amazing, I keep thinking I don't like this block much and then I see a photo of your quilt at the next stage. And the velveteen is such a perfect touch! Ah, yes. This one is a winner. The velveteen, the prints you chose, and any of those bindings. Gor.geous. Wowwwww! I don't even know where to begin! I only started quilting last week (and don't have a sewing machine, so I'm doing it by hand), so this has blown...my...mind!!! Beautiful!!! I love this, and seeing your quilts always makes me try to quilt. Then I start working on one and it is total chaos. I will stick with drooling over yours. What a wonderful quilt you have made. This is one of the prettiest I have seen. Your hard work and care has been rewarded with an awesome quilt. Congrats to you. Beautiful! 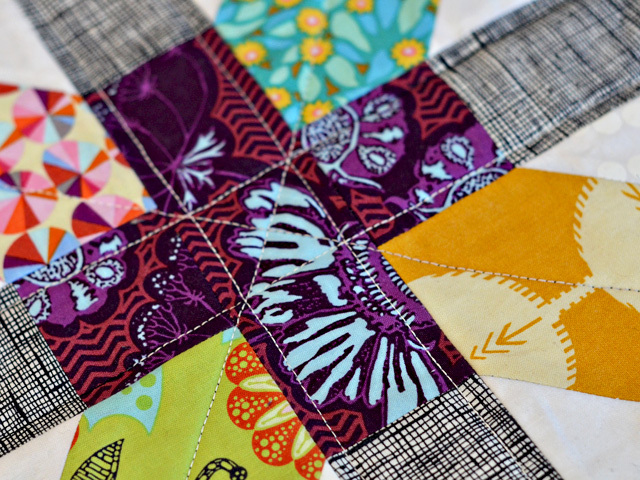 I really like how your use of color/contrast created an overall pattern in the quilt top. Oh, wow, this is turning out better and better at every stage. I love the velveteen backing and the choice of Field Study is perfect! 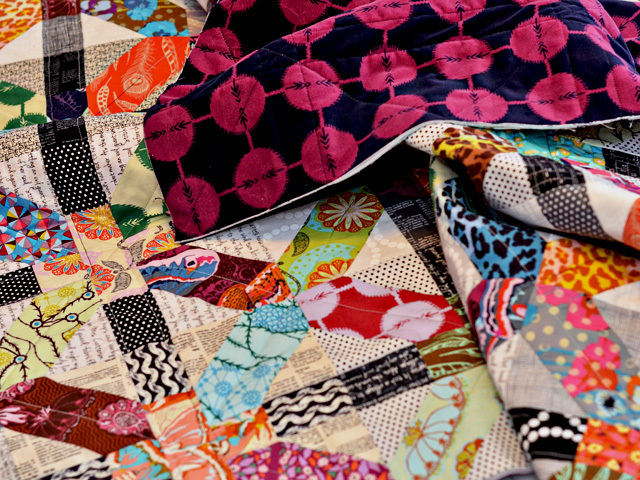 Did you start with a fat quarter bundle or half yards? Your low volume background and the darks for the "plus" ends really emphasize the values. First place award! Just gorgeous! I love this block and one day I'll get around to making a quilt with it as well. This winter I finished a couch quilt with silk batting and it is super warm and has lovely drape. I used a gorgeous heather grey flannel sheet for the backing - I love it. Try that next time you want a warm, snuggly quilt! 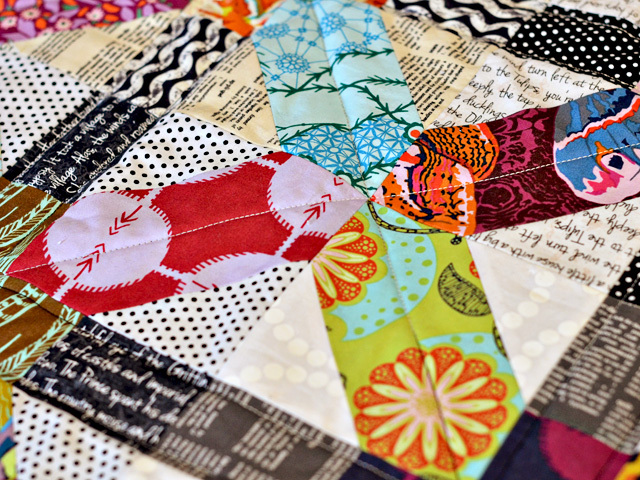 This might be my favorite x+ quilt! It's really great. Love the fabrics and the quilting. Wow! I'm just finding this quilt and love it! 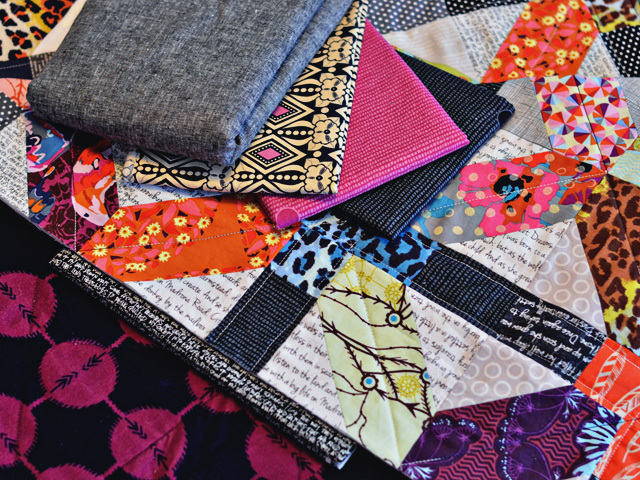 I've been wanting to make an X-+ quilt and yours speaks to me in such a great way. Can you tell me if you followed a pattern and, if so which one? Thank you for some exciting inspirations!